There is NO CLASS, WEDNESDAY, NOVEMBER 28. Starting Tuesday, October 16, there will be a class indoors in Victor, once per month every third Tuesday. This class starts at 7:00 PM. If attendance is poor, this will be dropped. The summer season is coming to a close. The week after Wine Country, handling classes will move indoors at Webster. NO MORE CLASSES HERE. Wednesday nights, 6:00 PM. This is outdoors at Steve's house. 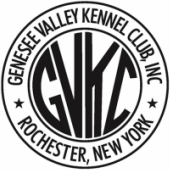 $5.00 per dog for members and junior handlers. $10.00 per dog for non-members. If you have questions or want to confirm whether class will be held and where, you may contact Sandy Nicoll at leadra@rochester.rr.com. This is the summer location (Used in the summer only).